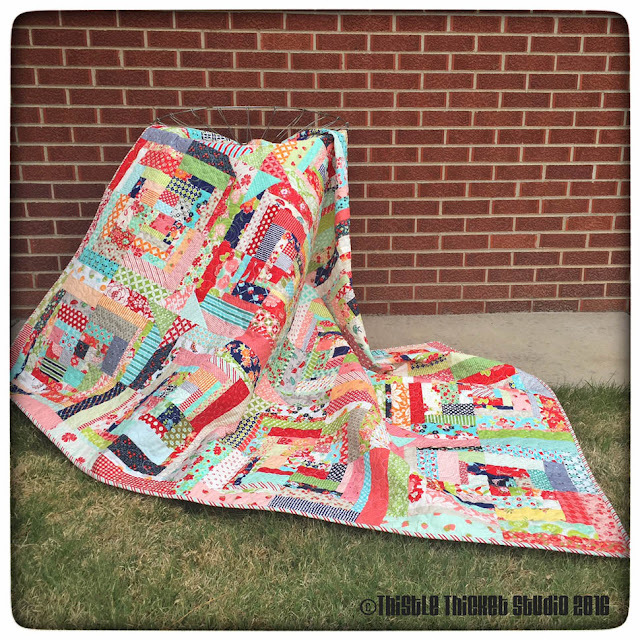 Quilting With Thistle Thicket Studio: B&C Log Cabin Swap Quilt Done! I finally got around to quilting my Bonnie & Camille Log Cabin Swap Quilt this week. This is the first online swap that I've participated in and I'm very happy with the results. Of course, I love Bonnie & Camille fabrics so anything made with them would make me happy. This was a swap on Instagram hosted by Samantha (@samanthaleeolsen) and Riann (@riann_g) and when they posted the invite last August, they were hoping for 11 people to participate. In less than 24 hours, they were overwhelmed with more than 200 participants! They did an awesome job with the swap too. It was so popular, a second swap was held last winter. Lissa Alexander, Director of Marketing at Moda, hosted the original Log Cabin Swap with a group of Moda designers last summer. You can find her instructions to make the blocks here. It was fun seeing all the different layout designs people came up with. I opted for the traditional log cabin layout - but with a twist. I had a few charm squares leftover, so I made pinwheel diamonds in the corners of the log cabin blocks. I used an edge-2-edge design to quilt it but trimmed out the pinwheel diamonds and used a spikey fill in those. The quilt is so busy, though, that you really don't see the quilting. The quilt ended up being 57" x 77", a great throw size. And check out that binding. I just love a stripey binding! Is 'stripey' a word? Just to keep it real - not everything went perfectly. 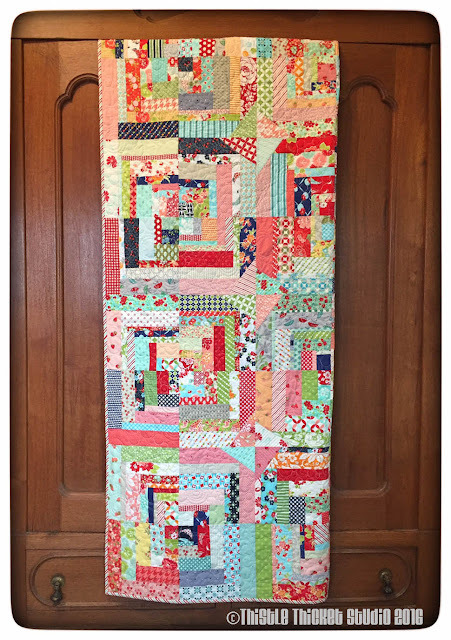 Out of the 36 blocks that I received back from the swap, I had to remake, repair, replace fabrics, etc. on 8 of the blocks due to holes, frayed seams, or spliced fabrics that just bugged me. Maybe I'm too picky! I was kind of disappointed at first, but it really didn't take that long to fix the issues. The fun part was a couple of people tagged their blocks so you could see where they came from. Wish I would have thought of that! And I received back blocks with a great mix of Bonnie & Camille fabrics that I would never have been able to accrue! Have you participated in an online swap? What was your experience? 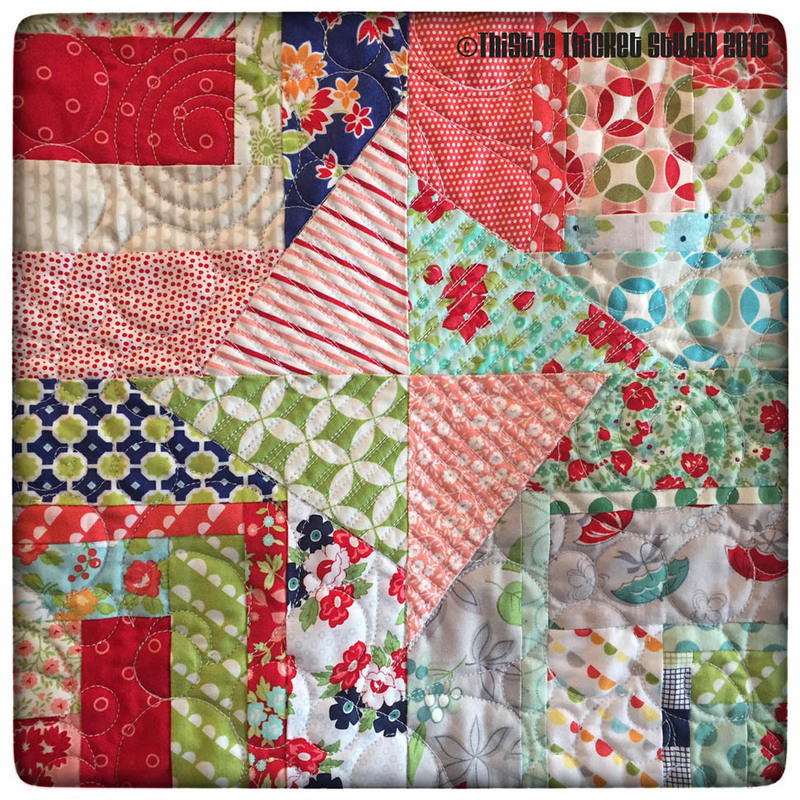 The good experiences far out-weighted the bad (and it really wasn't that bad) for my first swap and I may consider another swap in the future - if I ever get caught up on what I've got going on right now in my sewing room. Who am I kidding! Do quilters really ever get caught up?! P.S. This is also my first finish for the Q2 Finish-A-Long so I'll be linking this up at the end of the quarter. I'm also linking it up to TGIFF! (Thank Goodness It's Finished Friday). The finished quilt looks great, and stripey should totally be a word if it is not (spell check seems to accept it, though). :) I think that blocks from bees and swaps are a mixed bag. I received a bee block last year with such scant, scant seams that I backed the seams with interfacing. I went into a quilt for my husband, and it's held up so far.